Divergences may signify a trend reversal or in some situations, a temporary change of direction in a longer-term trend. If a trader is able to identify trend changes early by examining divergences, he has the potential to make more profitable trades. 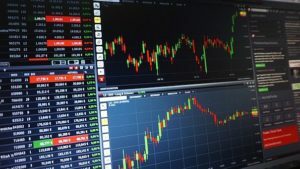 ​Also, a trader who recognizes early that a new trend is developingwill be able to maximize his earnings by entering the trade early and gaining more pips as the trend continues. Trading divergences arepracticed by comparing current price action (swings) with your selected indicator. Whenever the trend and the indicator (their swings) give opposite signals, it shows a divergence and a possible shift from the present trend. Any indicator-oscillator can be used to trade divergences.​The critical thing is identifying the divergences. In a divergence, if the price action is showing higher highs, the indicator will be showing lower highs,and vice versa. Hidden divergence shows that the current trend is likely to continue, while regular divergence shows a possible trend reversal. A regular divergence can be bearish or bullish. A bearish divergence will probably occur during an uptrend and at the point where price action indicates higher highs but the indicator is indicating lower highs. This implies that the present trend may be weakening and that a new down-trend may be emerging. For a bullish divergence, this is likely to occur during a down-trend. Price action may lead to lower lows but the indicator may show higher lows. This, too, suggests a weakening in momentum and the emergence of an uptrend. A hidden divergence is usually a little more difficult to identify than a regular divergence. Notwithstanding, it may be identified when the indicator shows a new extreme but the price action does not indicate this. This may not be a trend reversal but rather a sign of a pullback and continuation (or end of short-term correction) in the market.The moment a trader identifies this point as a hidden divergence, he can time his trade and gain by trading with the prevailing trend rather than against it. The bearish form of the hidden divergence is shown below. Notice that the hidden bearish divergence very accurately signaled further downside move of the market. Timing is everything when it comes to trading divergences.Trades should not be entered until the divergence is confirmed. Otherwise, it is possible for the current candle’s shape to change and thereby cause the divergence to disappear. The trader should consider other clues that may show a trend reversal or a trend continuation before continuing. For instance, while the indicators and the price action may show a trend reversal, the occurrence of a candle stick pattern may confirm that conclusion. The trader should also always watch for the indicator cross over before placing his trade. In bullish price action, trend lines should be drawn from the highs and should be drawnfrom the highs also on the indicator. In bearish price action, the lines should be drawn from the bottoms (lows). See the examples in our charts above. Consistency should be maintained in drawing trend lines either at the top or at the bottom of both price action and on the indicator. Otherwise, it may result in misleading information and throw off the analysis. ​Again,an additional trend line can always be drawn based on the opposite swings as shown in the chart below. A break below (or above in case of opposite example) the trend line also confirms that a new trend may have begun. ​Traders can make more profitable trades by trading divergences. This is accomplished by comparing price action with an indicator and identifying any conflicting (or diverging) patterns. A divergence may signal either a trend reversal or the continuation of a trend.